Making popcorn from home can be a fun, quick and easy win to feed hungry little mouths. 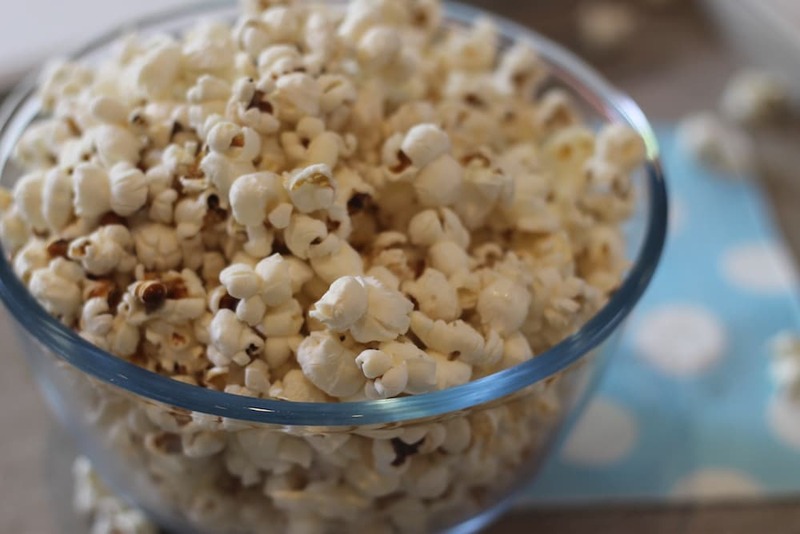 Avoid the microwave bags of popcorn as they are pretty toxic and why buy a bag of ready made popcorn when its so much cheaper to make at home in just a few short minutes? To make a good batch of popcorn you want to achieve two things: 1) pop as many kernels as possible and 2) avoid kernels burning at the bottom of the pan. This recipe flavour is the basic lightly salted version, but when you start making popcorn from home you can go really creative as there are endless flavour options. Share the post "PERFECT POPCORN"
Allergy friendly. Feel free to use an alternative oil for babies and kids with allergies and sensitivities to coconut. Heat oil a thick-bottomed saucepan on medium high heat. Allow all the solid oil to melt. Put 3 - 4 popcorn kernels into the oil and wait for them to pop. Now the oil is at the right temperature so add the rest of the kernels in an even layer, cover with a lid and reduce the heat. Gently shake the pan a couple of times to ensure all the kernels get a chance to pop. Remove the pan from the heat as soon as the popping sound slows down almost to a halt (but don't wait too long) otherwise they could burn.